WOW! A mound of knowldge!!! Thanks for sharing! Location: Right Beside You With A Gun! Paragraph breaks would make that more readable. When I started collecting Walkers as a rookie in 2002, the hardest thing for me was distinguishing a dipped slider from a true ms because of the notorious weak strike. I know that one should look for a break in luster but, at times, it is easier said than done. This is a series that is very easy to grade in circulated grades but becomes more difficult in the mint state range, in my opinion. Thanks Bob for the post. Another good article to read or to have is by the late famous Mr James Pryor (Half Dollar expert). You can get a copy from Coin Dealer's Newsletter website. Mr Pryor wrote an article on Full Strikes in November 1977. Great Read! Wow, Thank you. That is a well layed-out article, touching in every area to help launch us (me anyways) into collecting these "with" understanding. Thank you for the very informative thread. I started collecting Walking Liberty halves out of circulation back in the early 1960's. I only found coins dated in the late 1930's to 1947 that were [ at least to me ] really acceptable (VF20-AU53). All the ones circulating at the time dated from 1916 to 1936 were so well worn that I only kept a few scarcer dates. This partial set was sold off back in the early 1970's. After a hiatus of 20 years, I slowly started collecting them again; this time I concentrated on uncleaned-original- AU 53 - 58 coins. I also bought Bruce Fox's book before I bought anything. 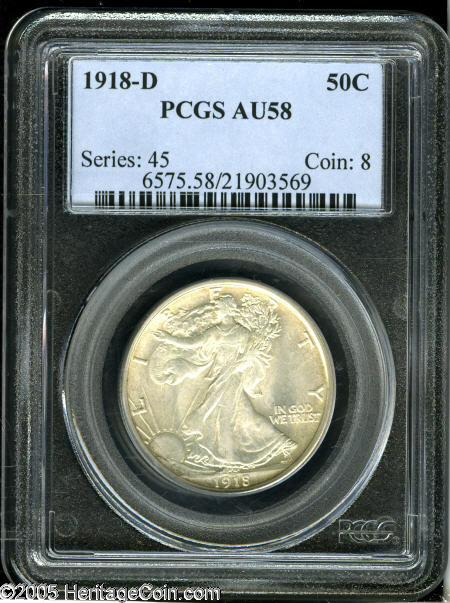 Yes, I agree with you on every point: keys are the three 1919's and the 1921's; the last two coins I needed to finish the set were the 1920-D & 1923-S- the best grade I could locate was AU53 for the 20-D & 23-S. 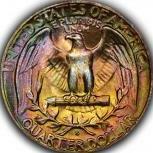 I also noted that most - if not all - coins from 1927 & 1928 were the worst struck coins of this series. The 1929's are also tough to find well struck too , but there are some very decently struck coins out there if you're lucky enough to find them. I also noticed that the 40-S, 41-S and 44-S are softly struck, yet I was able to locate well struck 40-S & 44-S. My 41-S is as well struck as I could hope for, but not a hand/thumb split. The majority of my set is "raw" and only a few of the keys are holdered ( in a mix of NGC/ICG/ANACS & PCGS) . Someday, I'll have the set certified, if for no other reason than to reconfirm my grading abilities. I concentrated on as well struck a coin ( full hand / thumb split & good head detail ) as I could find. All my coins have original skin and none have been dipped - let alone cleaned. The vast majority of this set was purchased with the guidance of Liz Coggan - who was invaluable in helping complete this set - and I feel the effort of locating strong strikes and original surfaces will be rewarded one day. My impression of this series is that its one of the most majestic coins ever produced in this country. I would heartily recommend that anyone who has, or may have, any interest ever in WLHs to print out what Bob has written and save it! Bob's experience with WLHs is real and his collection has been attained through hard work, knowledge and perseverence. Therefore, you are not reading the words of a "virtual" expert, you are reading the words of the real thing. I have not only been fortunate enough to have Bob tutor me on the finer points of this series, but he has also spent parts of two days with me pulling out boxes of WLHs to look at, and there is little experience that any WLH admirer can find more valuable than to look through a carefully assembled trove of WLHs. Read his posts, learn what he is writing about and go view his Registry set. QUOTE: " would heartily recommend that anyone who has, or may have, any interest ever in WLHs to print out what Bob has written "
Great idea. Done. Copied into word, formatted, put his name on it, printed, going into my WLH binder. Along with the other WLH comments from last few days. I'd buy Bob's DVD of instruction if he made one. Needless to say I've been impressed! As usual - great post Bob ! Good article, Bob, I enjoyed reading it. Even though I do not collect Walkers, I have owned several through the years. I agree that anyone who is going to collect this series needs to read your analysis and buy the three books that you recommend, if they can find them. Bedtime reading for my little collector. My set is complete with basically VF coins, which I consider to be the point at which Liberty's bust line is just showing, except for one coin: 1916-S. For some reason, it has just simply proven to be that elusive one, the one that everyone knows is tough, but is not considered a "key", yet I just cannot find one . I liken it to the 1937-S Washington quarter - not considered one of the "keys", but just try and find one in MS-64! One little thing I'd like to add: the 1938-D is overrated. It is by no means rare in any grade, and I think price guides inflate it's value somewhat. Bob, thanks for the fantastic writeup. Great article, Bob, I enjoyed reading it and will read it again and again. Untill it soaks in. The Complete Guide to Walking Liberty Half Dollars by Bruce Fox is online at Stella.